Click this link to download/play recording in MP3 format. Hog futures are trading lower in all months. Strong pressure has continued to develop through all hog futures trade with June futures leading the market lower with a $2.25 per cwt loss at midday. The inability to sustain buyer support at the end of last week has added uncertainty to the potential buyer interest through the end of the month. Even though traders continue to look for increased pork sales to China and focus on any potential trade agreement, the overall concern that the aggressive market structure early in the month may be overstated and hard to maintain long term is causing some traders to quickly reposition holdings, allowing for moderate to strong price losses Monday morning. Cash hog bids in early trade are called steady to $1 higher; bids are scattered within the range. Prices are lower on the National and unreported on the Iowa Minnesota morning reports. The morning cutout value is higher. The Canadian Dollar is trading higher against the US dollar at midday. For Monday, April 22, the Western Hog Exchange Olymel 17 base price is $1.939/kg dressed and the Olymel 19 base price is $1.941/kg dressed. This is Kerrie Simpson reporting from the Western Hog Exchange. As lean hog futures in the nearby summer months appear to take a small breather, deferred months like Oct and Dec continue to price in significant premiums associated with projections for increased exports later in 2019. Pork Cut-out vales illustrated to the right indicate pork continue to move seasonally higher and is tracking a very similar pattern to 2013. In that year the preliminary impacts of PED were beginning to take effect with the obvious big impact not coming until 2014. 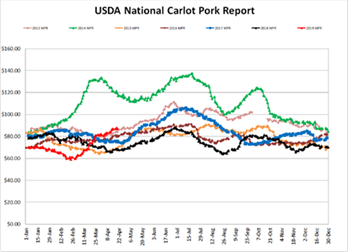 The USDA National Carlot Pork Report shown here shows that pork value in 2019 (red line) are the second highest levels seen in the past decade. And although slaughter and pork production continue to come in at record levels, prices are trading steady to firm, which is very typical for this time of year. If pork values continue to move in the right direction further strength is expected in cash markets which will provide strong pricing options for producers who may not have had the opportunity to contract any production. For any producers still able to forward contract production for the 4th quarter of 2019, it is recommended to have 50% of production hedged for that periods are risks still exist based on what is expected to be the largest slaughter and production quarter experienced in US history. Regional and national cash hogs were primarily higher throughout the week, with only Wednesday reported modestly lower amid the weakest daily bid volume in the last week. Cash bid volume was generally considered moderate. CME cash by comparison reported daily gains throughout, however day-to-day moves were more moderate in value. 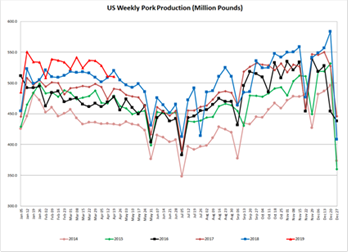 Wholesale pork values reported another strong week, as all primals improved bringing pork cutout $3.04/cwt higher than the previous week's average. Monitored Canadian hog markets were generally $2-6/hog higher on stronger US cash hog markets and the firming BoC exchange. Markets derived from regional pricing improved the most, with the Sig 3 up nearly $6/hog to pull the Sig 5 more than $4.50/hog higher from a week earlier. The OlyW 17 was also up more than $4/hog. The OlyW 19, Sig 4 and values out of Ontario were up near $3.50/hog, while those out of Quebec were up more than $2.50/hog. In the US, Tyson values were up only modestly while JM values improved near $6.50/hog. Another week of improvements on overall hog values helped strengthen margins again this week however have slowed in pace from the recent weeks of late March/early April. Canadian farrow-to-finish feed costs helped modestly with costs $0.25/hog lower, while those in the monitored US regions were stable to slightly higher. Hog margins based off the Sig 5 improved the most, up $5/hog, followed closely by those calculated out of OlyW 17 which were up near $4.50/hog. 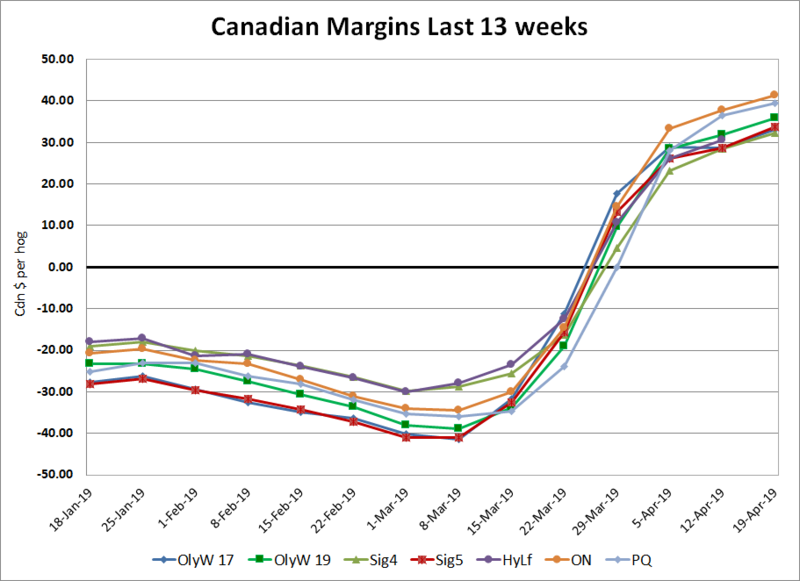 OlyW 19 and Sig 4 hog margins were up $4/hog, while Quebec and Ontario margins improved $3-$3.50/hog. In the US, Tyson margins strengthened shy of $1/hog while JM margins were calculated more than $6/hog higher. Disclaimer: Commodity Professionals Inc. presents this report as a snapshot of the market using current information available at the time of the report. These findings are for informational purposes only and should not be reproduced or transmitted by any means without permission. Commodity Professionals Inc. does not guarantee, and accepts no legal liability arising from or connected to, the accuracy, reliability, or completeness of any material contained in the publication.